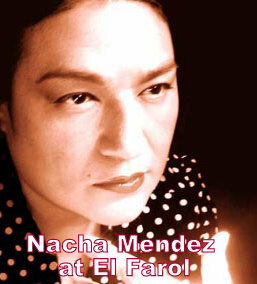 El Farol, the oldest restaurant and bar in Santa Fe, New Mexico, features the music of showcase Latin singer/song writer Nacha Mendez from 7-11 p.m. Sunday, Mar. 11. A stalwart business on SantaFe.com, El Farol is located at 808 Canyon Rd., Santa Fe, NM. Beginning at 7 p.m. on Sunday, Mar. 11 El Farol, a legendary Santa Fe watering hole plus dining landmark and featured business on the SantaFe.com Business Directory and Restaurant Guide, brings the amazing Latin rhythms of singer/songwriter Nacha Mendez to the stage. Hailing from the tiny border town of La Union in southern New Mexico, Nacha Mendez (also known as Marghreta Cordero) grew up singing and playing guitar. She learned how to play traditional Ranchera music from her grandmother. While learning her craft, she played in border towns near El Paso, Texas with her cousins, the Black Brothers, who are sons of the ex-Mothers of Invention drummer Jimmy Carl Black. She studied classical voice and music at New Mexico State University then moved on to New York City, where she spent time learning flamenco guitar with Manual Granados of the Music Conservatory of Barcelona, Spain. More recently, Mendez received a National Endowment for the Arts Award and a fellowship from Mutable Music. Nacha. She has also collaborated with composer Steve Peters, who produced Bodega de Amor and Volando. “My Burning Skin to Sleep” on the 2004 CD release Shelter by Steve Peters, distributed by the Cold Blue Label, features the voice of Marghreta Cordero aka Nacha Mendez. Her recordings include "Slowly Rising" (as Dueto Le Momo), and "Blue Silence," "Bodega de Amor" and "Volando" (as Nacha Mendez). She was voted Best Female vocalist in 2009 and 2010 in Santa Fe, New Mexico. Beginning at 7 p.m. on Sunday, Mar. 11 El Farol, a Santa Fe dining landmark and featured business on the SantaFe.com Business Directory and Restaurant Guide, brings the Latin rhythms of singer/songwriter Nacha Mendez to the stageShe was voted Best Female vocalist in 2009 and 2010 in Santa Fe, New Mexico. More recently, Mendez received a National Endowment for the Arts Award and a fellowship from Mutable Music. Nacha.She studied classical voice and music at New Mexico State University then moved on to New York City, where she spent time learning flamenco guitar with Manual Granados of the Music Conservatory of Barcelona, Spain.